Here is a perfect recipe for this season of vata when nature tends to make you feel a bit dry and ungrounded. You might have noticed that your sleep is lighter or gets interrupted easily and that pains and aches have increased in your body. This recipe will certainly get vata grounded as it is nice and savoury but without strong spices. It is warming, heavy and with plenty of fats! Do not worry about the fats, especially in this period. If you eat with awareness you won’t be putting it in storage. I make the pastry with ghee, which doesn’t mind heating. Ghee is a good fat, which doesn’t increase cholesterol and in fact, improves digestion and metabolism. I also use spelt flour for the pastry as I try to take in as little as possible refined flours (and sugars). Try this, it is wonderful! Mix salt with spelt flour and then rub the ghee in with your fingertips. Add water and work until the pastry becomes smooth. Leave to chill for 30 minutes. Cut broccoli and cauliflower into medium sized flowers and boil for 4-5min. Drain and wash with cold water. Chop onions to fine size and fry in a pan with ghee and garlic. Add mascarpone cheese, blue cheese and stock. Add either fresh or dry herbs and salt to taste. 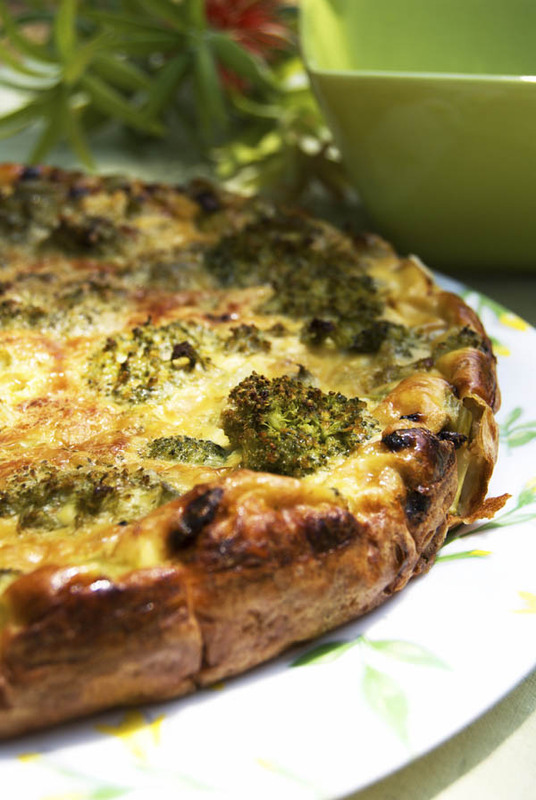 Lay the pastry in the bottom of an oven tray, pour the cheese sauce at the bottom and lay the broccoli flowers and cauliflower on top. Cut cooked spelt spaghetti into 2cm pieces and sprinkle some on top of the pie. Grate parmesan cheese on top and bake in the oven for 30 minutes at 175 degrees until golden brown and crispy on top. Next Soupy chicken stock !